There has been endless argument over McLaren's equal treatment for drivers policy, some disbelieving it entirely, others pointing out that perfect equality is impossible, yet others considering it inferior to the practice of having a stated number one. And now Pedro de la Rosa has aired views that seem in conflict with his employer's policy. Several things strike me about this. As Keith Collantine has pointed out in F1 Fanatic, Pedro's statements certainly indicate that the equal opportunity program is McLaren's way - or there would be no point in his disagreeing with it. Keith goes on to wonder whether this is a sign that de la Rosa is soon to leave McLaren, while at least one commenter sees it as a public relations exercise allowing Pedro to remain on good terms with both McLaren and his Spanish supporters. There are indications that de la Rosa is getting restive, his recent mention of his desire to get back to racing rather than testing being a sure sign. But I would have thought that, if he had genuinely given up on the idea of ever gaining a race seat in F1, he would have just resigned. It seems a bit unnecessary to have to invite termination by making contrary statements to the press. In fact, the likelihood is that we read far too much into any statement in F1 these days and Pedro was just being honest, without thought of the fallout he might cause. He has a fine line to walk between the opposing forces of employer and fans, after all, so anything he says is bound to be over-analyzed. Even so, it is an odd thing to say in the circumstances. More than anything else, it reminds me of Nigel Stepney's admission to Autosport in late 2006 that he was dissatisfied with his job at Ferrari and wanted a sabbatical. At the time, that struck me as a strange anomaly, Ferrari's sensitivity to public criticism being well known, and could only guess that he was trying to put pressure on his employers to give him the time off. Perhaps things would have turned out very differently had they done so. While McLaren are a little more thick-skinned when it comes to internal dissension (as demonstrated by their perseverance with Alonso to the end of 2007), Pedro may be pushing things a bit by such open disagreement with company policy. McLaren already have sufficient grounds for his dismissal in that he was an admitted participant in the "espionage" scandal - surely cause enough for marching orders to be issued. I admit I was surprised when McLaren did not quietly "let him go" after the season ended. But that is reckoning without our dear friend, Max, of course. Since he was concerned enough about retaliatory action by McLaren against Alonso, it is quite possible that he would see de la Rosa's dismissal as vengeance too. No sense stirring up that old fire! So perhaps our conspiracy friend is right and the whole thing is an exercise in public relations to allow Pedro to depart without re-opening old wounds. McLaren escape without being accused of getting rid of their test diver through spite and Pedro gets what he wants - a chance to race again, this time in another series. It's a theory, anyway. 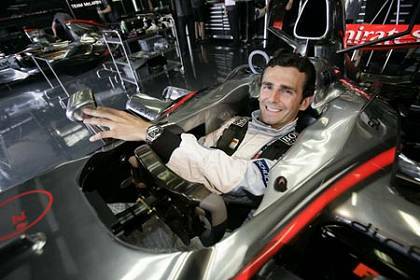 And the fact remains that McLaren do provide their drivers with equal equipment, which is all they are claiming. You can talk of how timing of pit stops must inevitably introduce inequality but how finely do you want to split this particular hair? Let us say that, as far as it is possible, the team is even-handed in dealing with its drivers. Alonso may have made the point that Ron was much nicer to Hamilton than he was to the double champion, but that is life - we all like some people better than others. Fernando should have thanked his lucky stars that he was in a team where personal friendships did not get in the way of fair treatment on the track. As to whether the equality policy is the right strategy, last season would seem to indicate that it is not. Things would have turned out very differently had Alonso been given number one status from the first (and Hamilton would have accepted it willingly enough at the time - it was only once he realized that he was as quick as the champion that he began to argue for equality). Yet who would recommend a situation such as Schumacher enjoyed in his Ferrari days, where one driver is always regarded as number one and the number two must, of necessity, subjugate his own ambition to the success of another? What's the point of this issue, reported on other sites also? Pedro tells the truth "equality is McLaren policy" and continues his opinion is "there should be a #1 and #2". Both statements are valid but in fact sometimes things CAN'T be equal. Hamilton was long term 'family' and Alonso was literally taken in as an orphan off the street. Equality may be the McLaren 'team order' but one was a rookie and the other a two time champion. Hamilton and Alonso COULDN'T be equal. Surely McLaren's plan was 'Hamilton the first rookie champion' !!! "Equality" in this case is absurd! And Pedro's ascertation about #1/#2 ..... is correct. Most teams and most drivers accept that fact. Ferrari, Schumacher #1, Barrichello #2; Renault, Alonso #1 Fisichella #2; and you can fill in the rest. I think Ferrari in 2007 (both team and drivers) handled it the best way.........REAL equality until the scales tip in one's favor and then support by the lesser to the end, of course that requires cooperation between the drivers and it can't be seen as dreaded "team orders". It was very late in the day that Ferrari decided which of their drivers to back, Number 38. Had Massa fared better at Monza, they would have continued to dither until the end of the season, just as McLaren did. When it comes to it, any team will back the driver who has the best chance of winning the championship. Ferrari did it when Schumacher broke his leg and had to support Irvine when he returned for the last few races; even McLaren did it when Hakkinen was clearly the championship leader and Coulthard trailed in the points. The difference (and what McLaren mean by equality) is that Ferrari would give the latest tweaks to Schumacher's car first and give him access to his team mate's data but McLaren ensures that both cars are equal and data is shared (another thing that got up Alonso's nose). In other words, McLaren give the drivers identical cars and let them race. That may be the fairest approach but, with drivers so equal that they finish on the same number of points, one point behind the winner, it may not be the best one. Team orders is defined as manipulating the result of a race - so it is illegal to radio one driver and tell him to let his team mate pass. But giving him a slow pit stop to allow the other into the lead amounts to the same thing. HI Clive........you know we're just playing with words. "....you can't maintain that Massa gave the race and the championship to Kimi and then deny that it was effectively manipulating the result of the race." I can , Massa can't !!! And we all saw him do it..........but in Brazilian GP and the Massa/ Kimi switch I might make an arguement that it was a matter of SPORTSMANSHIP ! No, we're not playing with words, Number 38, we're playing with one of Max's rules! It may have been the right thing for Massa to do, to let Kimi through to win the championship, it might have been gentlemanly, sportsmanlike and honorable - but the rule states that thou shalt not manipulate the race result. If Massa allowed Kimi to win, he contravened one of the FIA's laws, as simple as that. It's not my fault if it's a bad law. In fact, I have always said that it's one of the worst rules in the FIA book and completely contrary to what we have always known as F1.